Fire Equipment Chicago | Fire Pumps IL | Fire Pump Controller 60124 - Aquarius Fluid Products, Inc.
For 30 years Aquarius has helped Consulting Engineers, Fire Sprinkler Contractors and End Users apply, source, commission, maintain and test Fire Pump Systems that comply with local and national life safety and property code requirements. 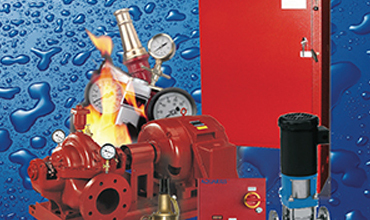 We provide fire pump equipment designed for sprinkler contractors, electrical contractors, property managers and building owners. 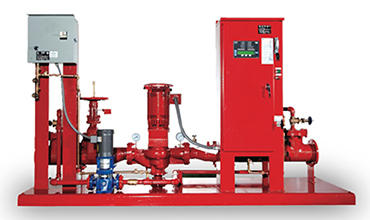 Specializing in complete UL/FM fire pump systems for new construction projects, retrofits and separate components including fire pumps, fire pump controllers and jockey accessories for turnkey replacement applications. We assist with Engineering Application, Sourcing and Supply, Start-up, Commissioning and Testing of new Fire Pump Systems. 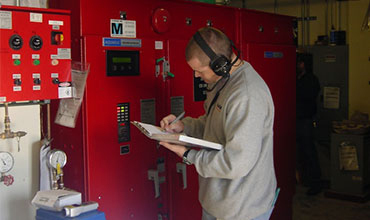 We also inspect and test existing systems and provide replacement components. Annual Fire Pump Testing is performed in accordance with NFPA 25 guidelines with coordination between building personnel, fire department and insurance authorities. We offer turnkey fire pump system service repair and/ or replacement of fire pump system components as required. Why Choose Aquarius Fluid Products? I’ve been dealing with Nolan for 15 years. Never once thought about looking for another vendor to perform our testing. Thank you Barry, Justin, Rob and Brian for all your help! And thank you Jennifer, for easy scheduling. You guys are great!